Do you like fairytales? 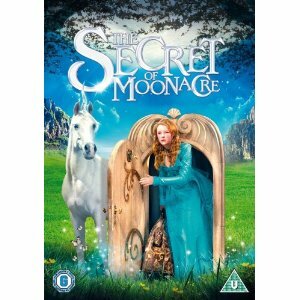 I almost hesitate to ask the question, because The Secret of Moonacre is akin to the Narnia Tales in that it has undertones of sacrifice and resurrection. At one level, it is a rollicking tale of good and evil, with a sound moral lesson for everyone to learn. At another level, it is a charming tale set in a cursed valley, with darker elements of greed and revenge. The film is based on the children’s book, A Little White Horse, by Elizabeth Goudge (Published 1947.) As a film it works for all who like spectacle, nature and creative, spellbinding tales, it is quite charming with a background of whimsical humour. I watched it by chance, not knowing what to expect, consoling myself in the darker patches with the thought that it was after all a fairytale, wasn’t it? To be honest, it was no darker than the early Hogwart’s films. I’m a big softy really, so it was just as well. The imdb movie site gives a good starter review of the story without spoiling the plot. Would I buy it for my film library? Probably not, but I think it worth a view if you need totally taken out of yourself. This entry was posted in Film Reviews and tagged Elizabeth Goudge, Evil, fairytale, film, good, love, resurrection, revenge, Secret of Moonacre. Bookmark the permalink.